Set sail and weigh anchor for an adventure across the sea. Treasure awaits the sailor who is prepared. Quickly grab the supplies you need to complete your journey and return with the most treasure to win. 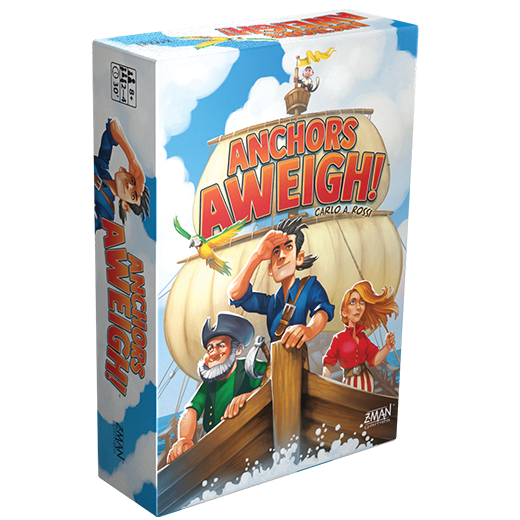 Anchors Aweigh is available for pre-order from our website or your local retailer. If you’re at Gen Con this year make sure to stop by booth 1429 for a demo! To prepare for your adventure at sea, you’ll need to quickly grab supplies to fill your ship in this real-time game. Pile the various assets onto the center of the table. Leave the tiles how they fall, faceup or facedown. Set thirteen adventure cards around the pile of assets and you’re ready to load your ship. Once the game starts, flip the adventure cards faceup and you’ll see what you’ll need to load your ship with to complete Discovery, Trade, Contract, and Pirate cards. You have to be quick though. The other players are trying to grab assets to fill their ship at the same time. Flip the asset tiles faceup as you hunt for the items you need. You may need a spyglass tile for one Discovery card but also need a spyglass and a shovel to complete a different card. 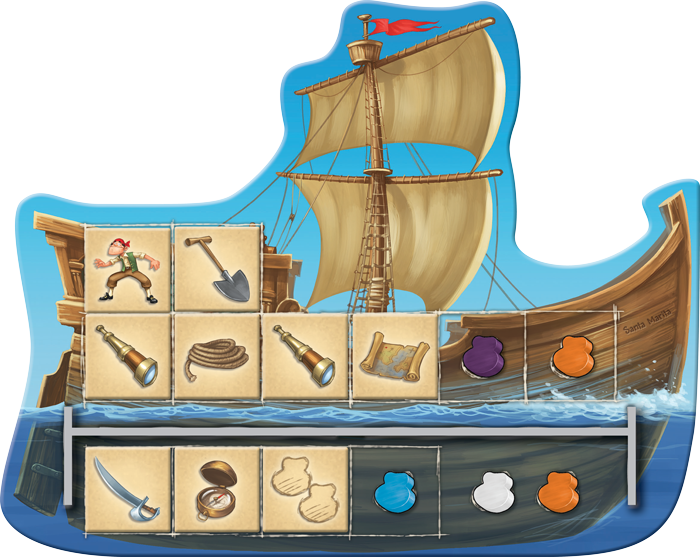 Try to fill your ship with the correct assets to complete as many adventure cards as you can. Each player has eight spots above deck (in front of the screen) and six spots below deck (below the screen). Tiles and cargo placed below deck will be hidden from the other players. The two spaces below deck without the square outline can only carry cargo, not assets. The other spaces you can choose to place asset tiles or cargo tokens. The first player to fill their ship calls out “anchors aweigh!” and gathers the faceup adventure cards. The other players will have to fill the rest of their cargo holds from memory, hoping they grabbed the right supplies to complete the cards. Once everyone has a full ship, it’s time to embark on an adventure of discovery. Did you gather the right supplies? Once everyone sets sail with a fully loaded ship, you’ll encounter many different adventures. The adventure cards are shuffled and resolved one at a time. If you come across a Contract card (the red flag), move that to the bottom of the deck and resolve the others first. The cost to complete a card will be on the left. If the card needs a spyglass tile, all players who have that asset tile can choose to trade it in for the reward, which in the example below is one orange and one white cargo token. You can only take cargo tokens that fit in your ship’s hold. If you have traded or discovered the cargo tokens you need for Contract cards, you can choose to trade those pieces in for treasure! After earning treasure, you must convert any leftover cargo tokens into coins (1 coin for each cargo token) and turn the coins you have into treasure chests. For every ten in value of coins, trade them in for a treasure chest. Treasure chests will take up one space each in your cargo hold, giving you less space for cargo in the next round. The sailor with the most treasure at the end of two rounds will be the winner! 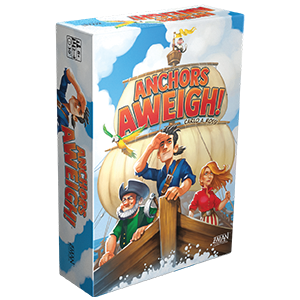 Pre-order your copy of Anchors Aweigh today.